Singing the Lord’s song… in a strange land. 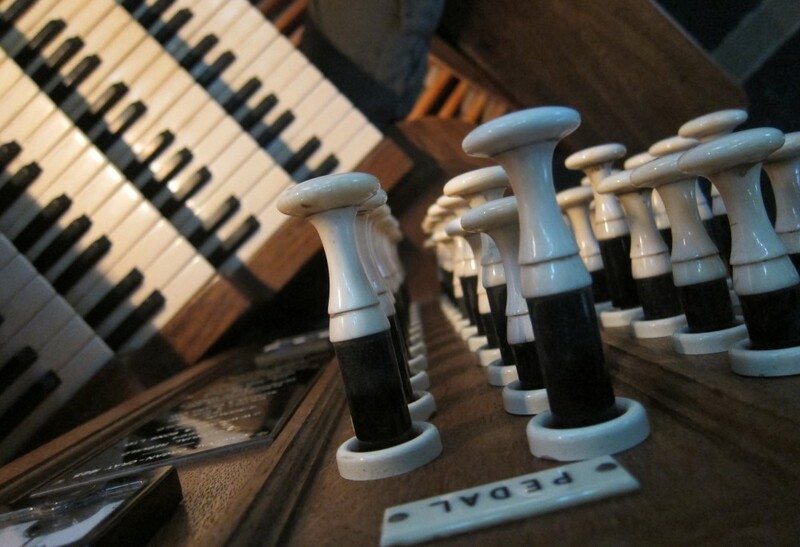 It has always been one of the most exciting and interesting parts of being an organist to discover new organs in buildings hitherto unknown to me. I’ve enjoyed the enviable privilege of having played some incredible instruments in some awe-inspiring venues. Also, it is good to experience different forms of worship, where there may be things you recognise, but at other times you are dramatically shoved out of your comfort zone and you have to fly-by-the-seat-of your-pants! With St Mary’s Choir, I have experienced many life-changing experiences, retold in previous and possibly future tales on this blogsite. Recently, we had a superb tour of Belgium and France and this thrust me into another experience where my rather poor language skills and an ‘Act of God’ conspired against me – once again! We were due to take part in a Mass at a Catholic Church. I did my studying beforehand and thought that I would be OK. Musically, there was no real problem – the choir had learnt the usual Mass setting and, after all, it couldn’t be THAT different from our usual Communion Service, could it? The Organ, it has to be said, was magnificent. Positioned high in the Nave, with a position that was to DIE for – the only trouble was, access to it could easily arrange that event. We reached the instrument by climbing a never-ending spiral staircase, and then via a little door taking us outside onto the roof of the Nave, and then an undignified clamber back into the triforium and along an extremely narrow passage. It was then that I met the Organist, and thanks to the valiant translations of our Organ Scholar, we found out that the PA system had been struck by lightning the previous night, and our only link with the service that was taking place 100 metres below, and was about to start, would be filtered through him! It was at this point I realised that my rather poor pigeon-French was not going to help too much, as I strained to hear the announcements. ..AT LAST, some words I recognised… but that was about it for the next hour-or-so! At various times during the service, I launched with trepidation into what I thought was the right piece to play at the right time. As we could not hear the choir from this elevated position, (without the thunder-struck PA system), my success or failure was judged by looking at the face of the Organist, who at one stage grabbed my hand off the keyboards as I was about to launch into a rather timid ‘Sanctus’! At one time, I looked up to see him with his face in his hands, and I’m sure I heard a French whimpering sound, followed by a Gallic shrug. Later in the Service, he kindly, but firmly entreated me to vacate the stool (ie shoved me off), as he gave an inspired improvisation at the moment of the ‘élévation’– something which I had read about, but never experienced. Later, during what I gather was the Sermon/ Homily / Exposant / Oration, or it could have been the weekly notices or football scores, as far as I knew, we swapped stories in a whisper, about Anglo-Franco organs we had played and I found out that he had been taught by none other than Maurice Duruflé himself! As the Mass drew to a close, I felt that maybe Anglo-Franco and Protestant-Catholic bridges had been built until a slightly horrified look came on this Organists’ brow – I was going to play a PREPARED voluntary and not an IMPROVISATION! So Prelude & Fugue in A minor by J S Bach (BWV 543) got an airing instead! The choir processed out, the congregation left very swiftly, but I had a great time, until it was time to descend (via the roof), from my eyrie and rejoin my fellow tourists before finding our coach and heading back to the hotel. It was then, and only then, that I realised that I had completely played the wrong communion motet! The loneliness of the long-distance Organist….! The position of the organ reminds me of the one at Brussels cathedral, which I once visited quite late in the day. I was thrilled when an organist came in, to run through music which was clearly going to be recorded, as he had assistants checking the timings and acoustics. I could have sat there all night – but an elderly man, with a bunch of large keys came up and jangled them under my nose – a strong hint which I could not ignore!